Recombinant full length rat peripherin purified from E. coli. WB: Rat spinal cord homogenate. ICC/IF: Mixed neuron/glia cultures from newborn rat brain. Our Abpromise guarantee covers the use of ab4666 in the following tested applications. WB 1/1000 - 1/2000. Detects a band of approximately 57 kDa. 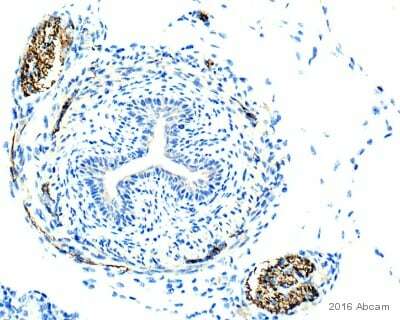 ab4666 staining Perpherin in mouse oesophagus tissue sections by Immunohistochemistry (Formalin/PFA-fixed paraffin-embedded sections). Tissue was fixed with formaldehyde and blocked with 1% BSA for 10 minutes at 21°C; antigen retrieval was by heat mediation in a citric acid. Samples were incubated with primary antibody (1/1500 in TBS/BSA/azide) for 2 hours at 21°C. A Biotin-conjugated goat anti-rabbit IgG polyclonal (1/300) was used as the secondary antibody. Transverse section through e16 oesophagus shows strong positivity in vagus nerves and also in individual nerve fibres. 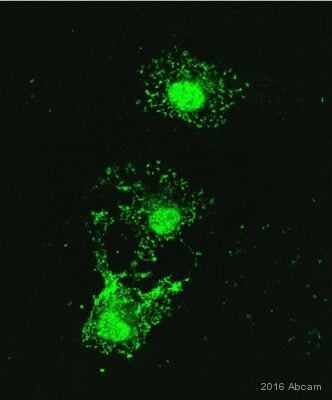 Immunocytochemistry/Immunofluorescence analysis of mixed neuron/glia cultures from newborn rat brain labelling Peripherin (green) with ab4666 and Neurofilament heavy polypeptide (red) with ab4680. A class of large neurons, like the one at the top right of this image, contain peripherin, while the majority of neurons and their processes contain Neurofilament heavy polypeptide and not peripherin. The blue channel reveals the localization of DNA. 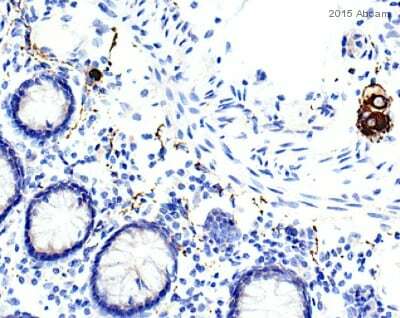 ab4666 staining Perpherin in human colon tissue sections by Immunohistochemistry (Formalin/PFA-fixed paraffin-embedded sections). Tissue was fixed with formaldehyde and blocked with 1% BSA for 10 minutes at 21°C; antigen retrieval was by heat mediation in a citric acid. Samples were incubated with primary antibody (1/2000 in TBS/BSA/azide) for 2 hours at 21°C. 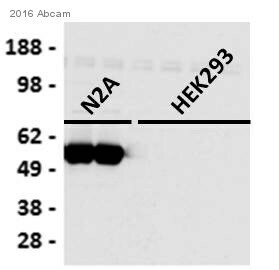 A Biotin-conjugated goat anti-rabbit IgG polyclonal (1/300) was used as the secondary antibody. The image shows the interface between mucosa and submucosa. Individual nerve fibres in the lamina propria and ganglion cell bodies of the submucosa (Meissner's plexus) are positive. 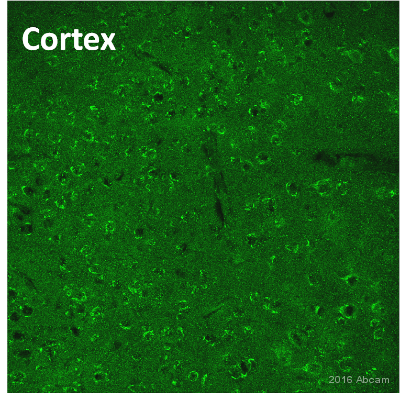 Cells and fibres of Auerbach's plexus are also positive (not shown but, identical to that shown in another abreview for this antibody). 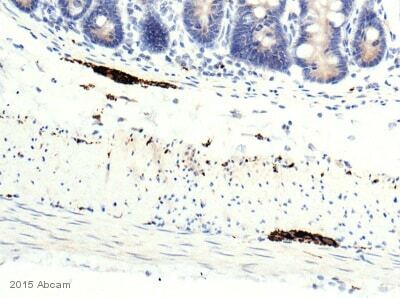 ab4666 staining Peripherin in pig small intestine tissue sections by Immunohistochemistry (IHC-P - paraformaldehyde-fixed, paraffin-embedded sections). Tissue was fixed with formaldehyde and blocked with 2% BSA for 10 minutes at 21°C; antigen retrieval was by heat mediation in citric acid. Samples were incubated with primary antibody (1/2500 in TBS/BSA/azide) for 2 hours at 21°C. A Biotin-conjugated Goat anti-rabbit IgG polyclonal (1/300) was used as the secondary antibody. 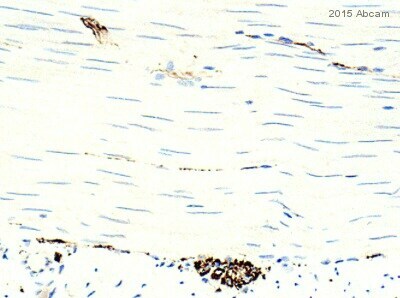 ab51424 staining Peripherin in goat small intestine sections by Immunohistochemistry (IHC-P - paraformaldehyde-fixed, paraffin-embedded sections). Tissue was fixed with formaldehyde and blocked with 2% serum for 10 minutes at 21°C; antigen retrieval was by heat mediation in citric acid. Samples were incubated with primary antibody (1/1500 in TBS/BSA/azide) for 2 hours at 21°C. A Biotin-conjugated goat anti-rabbit IgG polyclonal (1/300) was used as the secondary antibody. Publishing research using ab4666? Please let us know so that we can cite the reference in this datasheet.